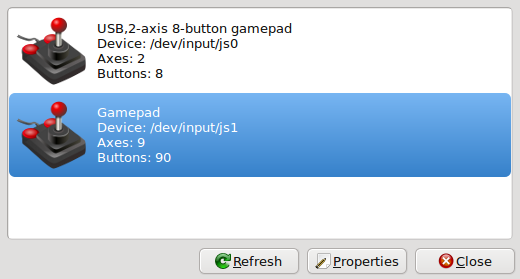 The bluetooth gamepad is listed and when tested in "jstest-gtk", buttons are working fine. However zsnes, mame, advmame, fceux and supertuxkart only recognize the USB gamepad. When I'm trying to assign keys, nothing happens when I press the buttons in the bluetooth gamepad only when I press buttons in the USB gamepad. The only way to make applications detect the Bluetooth gamepad, is by disconnecting the USB gamepad, and even then the Axis is recognized as J0x and the buttons as J1x. Browse other questions tagged usb bluetooth gamepad joystick or ask your own question. How to remap gamepad axis? How can I make a bluetooth joypad that works fine within Ubuntu work with games and emulators? How to get Magic-NS adapter working with Linux?